Traditional advertising and marketing strategies are often times expensive to own and demand a huge amount of resources in order for a brand to stay relevant in the market. Which is why TV, radio, newspaper and cinema advertisements as well as billboards are the major form of marketing mediums for big brands who can spend a lot. These marketing mediums are not quite apt fo the startups and small scale companies with modest budget. This is where the custom t-shirt designs will come in. The key is that you create a t-shirt that your customers would actually like to wear outdoors. So, both the print and fabric has to be of high-quality. Promotional t-shirts are a perfect way to attract make you brand popular in your niche area. It attracts interest and build a customer base, and moreover it doesn’t need much on your part. You should start by giving away customized t-shirt with your logo and message to your employees. Moreover, when you are in an expo or a tradeshow, you can give away your customized t-shirts to your customers or to the attendees. But the most important factor in this campaign is the design and quality of the t-shirt; make sure it appeals to your customers. Customized t-shirts are easy to create, cost-effective and creates a group of devoted fans and employees who wear them and become brand ambassadors everywhere they go in the community. This way, people see your brand and become familiar, thereby creating high visibility for a lower cost. Plus, if it gets on social media such as Facebook or Instagram, you will immediately get a massive number of followers and fans, both online and in your neighbour. Branded t-shirts would oftentimes start a conversation and create interest in the company or the event. The first set of people to target are current customers, members, or participants. You can leverage their friend circle and their influence by providing a conversation starter, which will ultimately expand your audience and reach more customers. If you give your customers a branded t-shirt, they feel more favourable and this bond makes them feel like they are part of your brand. When they feel favourable about your brand, they will definitely talk about it within their circle. Many startups would complain that their biggest challenge was either creating revenue or hiring talent. In addition to marketing your brand to your potential customers, it also gives you the opportunity to market it to your potential future employees. Start with your current employees so that they can market it to their friends and network of professions to expand the reach of your audience. Customized t-shirt has always been employed when bringing together a group of people for a common cause. The group of people wearing the same brand symbolizes they are a part of the cause. If you have ever participated in an event where your group is wearing the same customized t-shirt, it would definitely have an impact on your niche customers no matter the group was small or large. Hence, customized t-shirts are perfect to make a brand impression. 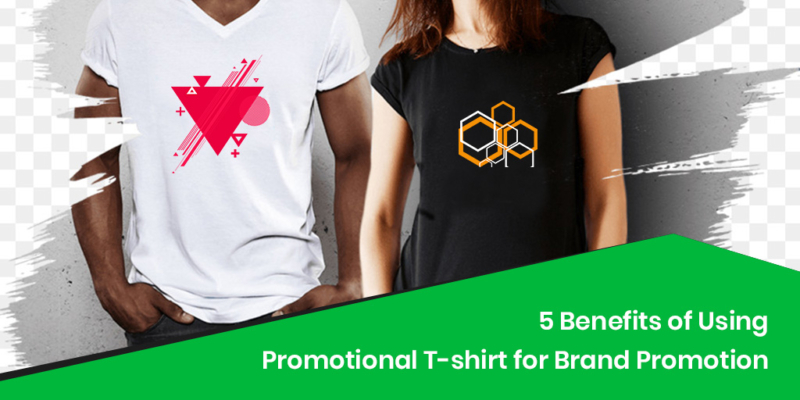 In an average a promotional t-shirt’s brand impression lasts for nearly 6 months. This means you have an average of 6 months of advertising, recruiting, team building and other marketing impact with a low cost branded t-shirt. The ability to last impression for upto 6 months with little investment is an easy win for the marketers. Promotional t-shirts are a cost-effective and a super-effective marketing strategy which will definitely help you establish your brand.